Hopwood-based artist Paula Hamilton visits a diverse group of local artists planning a show. Churches and chapels would provide brilliant exhibition space, were it not for all the paraphernalia of pews, altars, fonts and the like. So imagine a chapel with no pews, in fact no furniture at all, with long windows around the room, allowing lots of light into the space. What a glorious place to show and look at art! I have just described how Alvechurch Baptist Chapel currently looks, and it is in this space that Alvechurch Art Group will stage their next exhib-ition on May 18, as part of a Spring Fair. 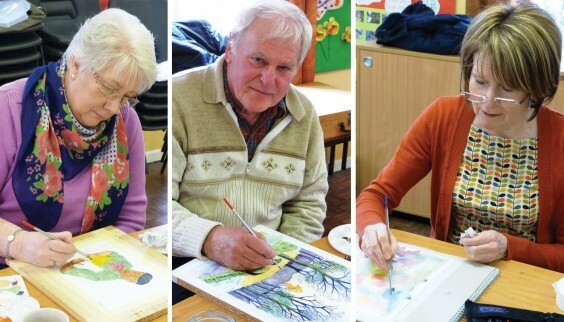 When Alvechurch Art Group were kind enough to let me come and visit them in the Baptist Church Hall, where they meet every Tuesday afternoon, I found 11 keen amateur artists working intently in a variety of media. Paul Birch has been attending for 13 years and has recently taken over as tutor, although it was clear that many of the group needed little in the way of teaching, having been honing their artistic skills for years. People generally do their own thing, while Paul will offer assistance if required. Paul himself is a self-taught artist who took up painting in earnest after retiring. When I visited, he was halfway to completing a very competent watercolour of St Paul’s Cathedral while his Eiffel Tower was already framed and ready for the exhibition. So where do members of the group find their inspiration? To begin with, the hall was full of books and magazines and I was told that the TV channel, Sky Arts, offers painting tuition. Other sources can be from artists; for instance there is a budding Beryl Cook in the group. Pauline Ellison will be entering several pieces in the style of Beryl Cook into the exhibition and specialises in watercolours and aquarelle pencil crayon. Trish Webster and Lyn Green also work mainly in watercolours and were putting a wash onto watercolour paper prior to painting more detailed land and seascapes. Denise Morris too, paints landscapes but, in her case, these are mostly local scenes. She was putting the finishing touches to a well-executed, familiar view of the Weighbridge in Alvechurch and plans to enter several other local scenes into the exhibition. Architect Gordon Griffiths has a fresh, illustrative style and will be showing his quirky country scenes.Bryan Haycocks is a relative newcomer to the group who has taken to art like a duck to water. His current piece is of trees in a delightfully mysterious landscape. Working opposite was Stan Newey, in the process of painting snow-laden fir trees in a winter landscape, a promising piece of work that conjured up a real feeling of winter. Ex-teacher Gentian Hancock was embarking on a chalk pastel of poppies and wild flowers, while opposite was the versatile Brenda Davis. She had just completed a study of a group of buildings and was ready to start on a second piece of work. A Gecko lizard was the chosen subject of Sue Thompson, who’d photographed the creature on holiday and was at work putting colourful dots on to his body. Jeannie Crosby had nearly completed a colourful, pretty semi-abstract piece based on flower forms. By the end of the session many pieces of work were nearing completion. Some members planned to go home and complete their work on the kitchen table, while others will wait until next week’s class. The art exhibition is a fund raising event for the further refurbishment of the Baptist Chapel; another £5,000 is needed to clean and decorate the Chapel and get it looking better than new. (Extensive work has already been completed to solve damp problems). By the time this magazine is published, who knows, winter may have finally retreated and spring may have sprung. Let’s hope we can finally enjoy the season and all it has to offer, including the May Fair with its exciting Art Exhibition in the stunning Chapel on May 18! Above: Pauline Ellison, Bryan Haycocks, Jeannie Crosby.